Welcome to parade registration. We are so happy that you’ve chosen to be a part of this great parade - the only 4th of July parade in Salem County - we look forward to having your entry in the line-up! Below you’ll find some really important information regarding the parade this year. Before proceeding with the registration stuff found at the end of this packet, please read all of the information and share your new-found knowledge with everyone in your group. Seriously, it contains some important information. All participants, regardless of past participation, must complete the registration form. We can’t guarantee spots in the line-up or make special promises to accommodate your group… please don’t ask. Please ensure you are lined up in the correct location, on the correct side of the street. This could and will delay your group. Please note that due to safety concerns, we are prohibiting horses from participating in the parade. 1.Creativity. This includes but is not limited to the design, use of music, participants, props, etc. 8. All walkers if not associated with a float/act must relocate to Location 5: Memorial Lake for staging. All parade entries must be decorated. Music accompaniment to your entry is a plus and is encouraged (we define just about any form of noise as 'music'). You can have a vehicle entry or a walking entry (or combination), your choice. Make sure to keep it family friendly. The 4th of July Parade is celebrating Americans birthday. Please note we do not allow paper literature to be handed out or any sort of solicitation during the parade. That means, no paper hand outs, fliers etc. We do allow floats to pass out candy and ice pops. However candy cannot be thrown from vehicles. If you would like to give candy out it must be done from members of your group walking along your floats or vehicles after Allen Avenue. This is to ensure spectators safety. Participants acknowledge and agree that photos or video taken during the parade sponsored by and/or included in the Woodstown 4th of July parade may be used without further consent or compensation by the Woodstown 4th July Committee for promotional purposes. This includes, but is not limited to websites, Facebook, social networks, articles, and any other promotional or news materials regardless of format. The parade starts at Millbrook and South Main and ends at Marlton Park. Total distance = 1.25 miles. All participants must be lined up By 9:00 AM and ready to go for judging at your staging area (these are listed below). 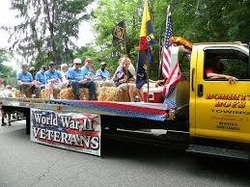 Our parade begins promptly at 10:00 AM on South Main Street at East Millbrook facing town (north). To achieve this timely step-off, all participants must be lined up at their staging area. The parade usually lasts anywhere from 1½ to 2 hours depending on how many participants are in the parade. Starting at 9 AM South Main Street and Mill Street will be closed. If being dropped off for the parade we recommend catching the bus at Marlton Park to be shuttled in. We are a rain or shine event! We ask that all participants please park at Marlton Park (Grandview Entrance/Lot) and a shuttle bus will drop you off at Memorial Lake Park. Buses run continuous until the parade begins. Marlton Park is located at 123 Marlton Road, Pilesgrove, NJ 08098. Performance routines are welcomed along the route, but must keep moving in a forward direction, keeping an even space between units. Please report to Location 5 (Memorial Lake) for staging unless you are associated with a float/group. Please remember we are all volunteers, giving our time to this great tradition. Parade volunteers will be stationed at Marlton Park and the parade staging areas in and around South Main Street prior to the parade. All volunteers will be in safety vest. If you have any questions on the day of the parade, flag down a volunteer. If you have questions prior to the parade please e-mail Andrea Godshall at woodstown4thofjuly@comcast.net. Volunteers will be staged at each location. All Participants must be lined up and ready for judging prior to 9:00 AM. If you miss your line up time or are dropped off after 9:00 AM you will need to go to Marlton Park to get the shuttle which will drop you off at Memorial Lake Park. There is no parking along the route, or at Memorial Lake Park. We need these areas closed for parade participants to line up. Location1 (Chestnut Run Pool): Police, Parade Marshall, Color Guard, Active and Reserve Military, VFW, ROTC. Boy scout’s assisting with Parade banners. Location 2 (East Millbrooke): Woodstown HS band, fire trucks, and ambulances. Location 3 (West Millbrooke): Floats with music and radios, bands, etc. and paid acts. Location 4 (On Right Side of South Main Street (facing town), starting at the Corner of East Millbrooke and going towards Memorial Lake on South Main Street): All other floats and or acts with no music, Elected Officials, Beauty Queens, Prom Kings & Queens. If you are a convertible car with a float, the car must go with the float, unless you do not mind being separated. All magnetic signs for kings/queens must be purchased by the participant. Magnetic signs will not be provided. All participates located on the left side of South Main Street will be issued in last. Location 5 (Memorial Lake Park on Ashbrooke Ave): Non-motorized bikes, wagons, scooters and all walkers, including girl scouts and boyscouts not associated with parade banners. ** All bike & scooter riders must wear a helmet to participate in parade. ** Meet at the this location and sign in at small table for judging. Location 6 (Ashbrooke Ave. facing South Main Street): Line up on the right side of the road along the park) prior to parking lot (which is blocked off): Classic Cars, Tractors, motorized cars, electric bikes etc. Parking for trailers is in Dr. Hubbs Office parking lot. Form 1 line along the right side of Ashbrooke Ave (Park side). Trailers that do not fit at Dr. Hubbs parking lot should locate to Marvin L Watson Memorial Park located on Bailey Street for overflow. Thank you for participating in this year's parade. Have a wonderful and safe Fourth of July.